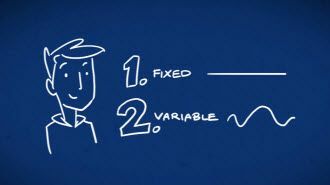 Think Variable is Better Than Fixed Mortgage Rates Now? Fixed or variable, the great debate! Many arguments during afterwork drinks are sparked by this question. Choosing a fixed rate in the current market will earn you a record low rate that will be locked in for a healthy amount of time. That’s a win win if you ask me but my team is still presented with the argument that “historically” Variable mortgage rates are better. Ok, yes this is true over the past 30+ years on average but that doesn’t mean it is the best as of today and certainly doesn’t mean it’s the best for you. For those of you considering a variable rate mortgage today, let's review the past 10 years of overnight lending rate fluctuations which affect Prime rate lending for variable mortgages etc. My suggestion would be to think twice based on statistical data if you plan to choose a variable rate today (November 2015). I believe variable rates have outperformed fixed rates as it was 'mostly' trending downwards and variable rates are less than fixed. If it starts trending upwards, which we all know is the only direction it can realistically go, fixed will most likely outperform. Please contact our office with any questions, we love to talk!